Ask Kurt about: "Fit for Future"
But I have realized, something has to change. That's why we're talking about getting fit today. Let's talk about making products fit for the future. What about your attitude? For example, oxy-fuel cutting? Old fashioned. Too complicated? So, let’s just automate it. Oxy-Fuel is cost-effective, ideal also for small plate thicknesses und delivers high quality. That you can use these advantages again in the future, we have sent the proven Oxy-Fuel cutting to the IHT fitness studio. 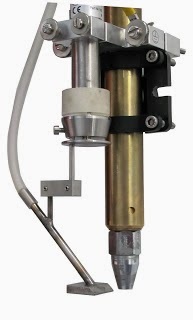 First we developed a new cutting torch with ignition, height sensing that even has a detection of backfire. Then we fully automated the oxy-fuel cutting process. Our new cutting system APC perfectly suites your application. No worry, no hassle. Simply Install and cut. With the fully automated Oxy-Fuel cutting system from IHT. I'll make you fit for the future." N°4 is the most important Fact when looking at the future of Oxy-Fuel cutting. Bringing the technique into the 21st Century and turning it into an autonomous driving cutting process: This is the task that lies ahead so that Oxy-Fuel can compete on a level playing field along with Plasma and Laser. So what needs to be realised is that an Oxy-Fuel cutting torch can be more than a dumb cutting nozzle holder. What else do you think should the torch should be able to do? Ignite automatically? You may say there are already one or two on the market, yes, but far from enough. Integrated height control or distance measurement? Flashback detection? Is that enough? How about detecting whether the flame is on or off? That's all? Do you need more? For me, these are just the starting points. The next step is fully integrated automatic gas control. You may say that this already exists on the market. Yes for sure, offered by many manufacturers, some better than others. The key point here is that what is needed is full integration and interaction with the cutting torch, height control system and the CNC. It is about the processes; pre-heating, piercing and cutting. It's about creating a true unified cutting database. What we are trying to achieve is to automate the process as much as possible, so that the operator can perform other tasks while the machine cuts. This aspect is still much neglected. You know this certainly: I have often heard in workshops "I do not know what to do. One cutting machine operator provides perfect parts, has a low wear on nozzles and other consumables, the other produces lousy parts, with r each piercing operation needing a new nozzle." What needs to be done is that the process know-how is transferred from the operator to the machine in an intelligent way. Fact N°4 Oxy-Fuel needs more automation PROVEN! Like me, your favourite bedside book is probably a copy of ISO EN DIN 9013, Thermal cutting - Classification of thermal cuts. If it isn't and you would like a précis, basically the Good Book says that whether you are looking at the squareness of a cut, the tolerance of the cutting angle or roughness of the finished cut, you will always find that Oxy-Fuel gets the highest rating. Of course you do have to be looking at parts cut in a production environment made from industrial quality steel and not those made on an exhibition stand to amuse the visitors clutching their giveaways! It is undisputed that the Oxy-Fuel cutting systems provide excellent quality. So Fact N°3: Oxy-Fuel produces high quality cuts. PROVEN! The results amazed me, I was stunned. I carried out a survey based on information I got from supplier of Oxy-Fuel cutting nozzles. The question I asked was, "How many cutting nozzles for each different sheet thickness do you sell? This was the result. The nozzle manufacturer sells very few nozzles for smaller than 10 mm (0.4") or larger than 100 mm (4" inch) plates, which did not really surprise me. What did was the quantity of nozzles for cutting 15mm plates they were selling and for larger sizes than that, the curve rises steeply. That really surprised me. So Fact N°2: Oxy-Fuel really is being used for small sheet thicknesses. PROVEN! Many of you have a mix of Plasma, Laser and Oxy-Fuel cutting machines in use, a perfectly normal set-up. We all know by now that each method of cutting has its field of use and there is a preferred cutting method for each cutting application. Every production floor will be equipped with several Plasma and Laser cutting machines and each plays its own important role in thermal cutting. Both of these cutting processes are like autonomous self-driving vehicles just like modern cars. But why has no-one mentioned Good Old Oxy-Fuel, whereabouts does that figure in today's cutting league? Some call it old and past it, or that it can only be used where there are people around to make it work properly. Stop: Wrong: This is not true! Oxy-Fuel (or Flame) cutting is still relatively young and Yes, in order to get the best results, it will need the help of an experienced operator. The story of Oxy-Fuel cutting has only just started. I feel strongly there is still great room for improvement (a phrase I remember from my school reports) and that it has a strong future: It does have an autonomous self driving future. All this is going to take, is the use of some properly applied innovative automation. Why is the Oxy-Fuel process so poorly automated at the moment? One of the reasons is to realise where the knowledge of the cutting process is these days and why this is? Let us compare Oxy-Fuel and Plasma. With Plasma in the beginning, the machine operator was there on hand to see and to hear if the cut was good. Now it's different, the manufacturer of the plasma source provides the plasma power source, the torch, the gas console and most importantly, the process know how which is now embedded in the system, safely hidden from everyone but him. The machine builder sells all he knows about cutting built into the machine and the user is just left to set the plate, enter the cutting data and start the cut, Job done! With Oxy-fuel cutting at the moment, things are different. Here a large part of the know-how is still with the user. The operator, who knows the process better, will produce the best results. He will produce higher quality results and will cause the least wear on nozzles etc. A less able operator will produce more scrap, cause more wear and his machine will require servicing more often. You have learned by long experience that to get the best results with Oxy-Fuel at the moment, you need to invest in well-trained staff. Perhaps you should invest more in the machine instead? We at IHT have a passion for cutting and more especially in finding ways of improving the process, why not join us and investigate the Facts. Wouldn't it be ideal, if the distance in bevel cutting would be exactly measured and controlled. However, this is a challenging task. First, a constant distance is extremely important for a clean cut and secondly exist extremely high temperatures in triple torch burner units. With the PLATE SENSOR IHT Automation provides here an approach for solving this problem. The electrode is air-cooled and this air flow makes sure that the distance measurement is only minimally affected by the cutting flame and the dielectric. The sensor system CSC 500 ensures that the set distance is measured correctly and the motor controller of the linear drive delivers a precise signal. To increase the productivity of oxy-fuel gas cutting machines, automatic ignition devices are often installed. However these internal ignition systems can sometimes cause problems to, or be affected by other parts of the cutting machine. Many users have experienced problems caused by piezo igniters or the 20kV ignition voltage that is developed at the burner tip. Others have systems where variations in gas pressure extinguish the flame which then requires re-ignition. To overcome these problems and others, IHT Automation has now developed its own ignition system that is impervious to external effects and will provide your machine with a simple and robust ignition mechanism.